I'm so excited to begin sharing a big project I've been working on lately! You know I love making quilts and will always, always want to start a new one, but I also love to make things for my home and family. In fact, that's where sewing started for me, and probably for you too. There are oodles of creative things one can do with fabric to craft a handmade home. My next online course is home-oriented, and it's coming along swimmingly! This course is a smorgasbord of materials and simple techniques. I always love to try something new, don't you? This is your chance to sample beading, ribbon applique, metallic thread and pompom trim. These fun materials are enticing, but modern, un-fussy renditions are uncommon. Well, the theme of this course is ideal for touches of fancy embellishments. I'm so enjoying creating these projects, getting the balance between familiar and adventurous just right. I bet you can guess our theme? Have you ever heard of couching? You're going to love it. So easy! We'll use it to make beautiful script words without breaking a sweat (or using the seam ripper). What about wool applique? Ready to give it a go? We'll use felted wool in projects from a quick, modern art piece to a luxurious statement blanket. This is not same-old, same-old. It's absolutely chic! I entered the design stage for this course months ago, brainstorming and sketching projects. Over the weeks I've weeded out a few duds and made multiples of my favorites. I've used melton wool, bugle and seed beads, ribbon, novelty fabrics, yarn, wool felt, canvas, metallic thread. A little sketch stitch applique here, a little quilt-as-you-go there, pintucks to transform another concept entirely. 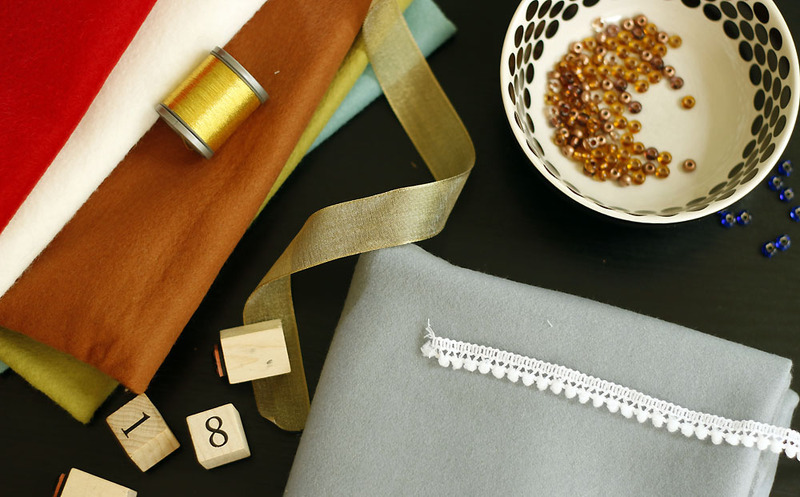 With exotic fabrics and fun embellishments, I've created quick and easy projects with exquisite results. I have so much to show you in the weeks to come! (I'm especially excited about this weekend's photoshoot! Yay!) On Wednesday I'll share my inspiration for the course and a few special projects. Don't want to miss any details? Sign up to receive email updates as the course launches this fall!